After 12 months in the barrel and over 8 months of conditioning in the keg, the saison from the 2014-2015 Austin ZEALOTS Barrel Project is tasting wonderful. Sour, light, and crisp, this past years’ barreled saison came out surprisingly well. 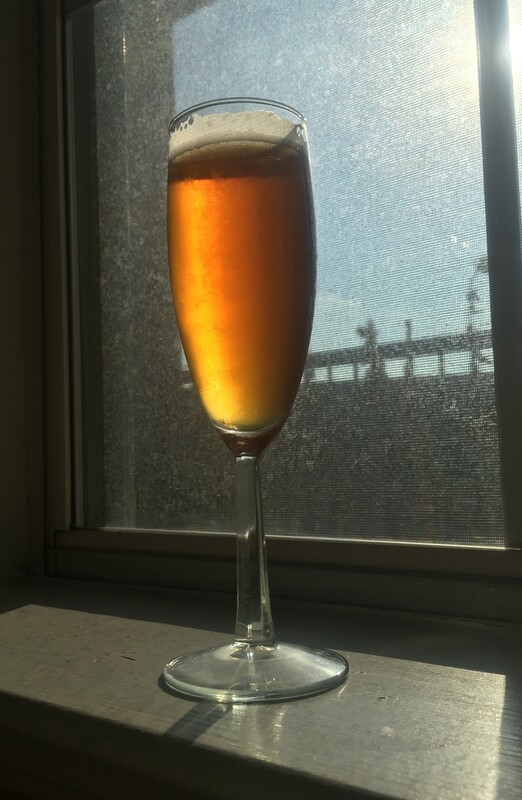 A continuation of the barreling series, this post is the follow-up of mostly my personal experiences with the final stages of this brew and some recommendations on replicating this recipe at home. Cheers and happy brewing! Each year, a number of members from my homebrew club the Austin ZEALOTS participate in a group barrel-aged souring project. Prior to February, group members vote on a beer style, brew five gallons of their favorite recipe, and then combine them in a 55-gallon wine barrel where it is stored at the great Jester King farmhouse brewery and allowed to age a year for souring. For the 2014-2015 season, we agreed upon saison as the style for souring where I previously documented my brew day efforts. Early this year in February 2015, a full year had passed and the sour saison was readied for racking and packaging. After pumping the saison out of the barrel and into kegs, we cleaned out the barrel with near boiling water and racked the 2015-2016 seasons barrel project: a Belgian Blond style. While I was a bit busy during this time of document its brew day (due to book writing), my recipe was more or less a standard Belgian Blond (Pils malt + sugar) fermented with Wyeast 3787 Trappist High Gravity. However, as an added twist at barreling time, we also introduced a Pinot Noir wine kit to the barrel (minus of grape skins) to add an extra layer of complexity to this brew. We’ll see come February 2016 how this comes out. I’m not holding my breath, but given the quality of the saison, I am very hopeful. More on this next year! Pouring into a flute glass, the barrel-project saison has a deep gold, orange appearance with fine white head. The aroma is unsurprisingly sour best characterized as acetic-forward reminiscent of a very nice apple cider vinegar, but overall very clean and pleasant. In tasting, more of the same, pleasant acetic character with hints of strawberry-rhubarb pie. On the palette, the beer finishes very dry, crisp and clean, reinforced with a high level of carbonation. When warmed, the beer aroma and flavor display a slight lactic character with notes of hay. Overall, this is a very nice sour beer and although much of the original saison character was not present due to the intense sourness, the barrel-project saison is best categorized as “Flanders” in character, of which its associated styles I enjoy drinking on occasion. As Drew Beechum put it plainly: the Austin ZEALOTS are “aggressively disorganized” which I take as a high compliment. From this observation, it should be no surprise that the ZEALOTS do not coordinate barrel project recipes and instead rely on the brewer picking their favorite recipe with the hope that at the end of the aging process, the blend of 11 or so different recipes will produce an interesting final product. As such, it’s nearly impossible to give a simple recipe to replicate this batch; however, here are my thoughts. To make a sour saison similar to the one described here, I suggest starting out with your favorite saison recipe. If you’ve never made one before, I suggest starting with Jamil’s recipe in Brewing Classic Styles, Drew’s Saison Ordinaire, or my recipe used as a component of the barrel project (linked here). Also, any saison yeast strain will do. My personal favorite is Wyeast 3724 Belgian Saison although Wyeast 3711 French Saison and Danstar Belle Saison are also great as well. In fermentation, I suggest using standard saison fermentation techniques (plenty of yeast, good aeration, possibly elevated fermentation temperatures) to achieve desired saison fermentation character. For souring, en lieu of a barreling, I’d suggest racking the saison into a secondary fermentor and pitching of Wyeast 3763 Roeselare Blend to achieve a similar “Flanders type” sour character from this brew. The duration of the secondary fermentation is up to you and can vary depending on several factors including the bug types, your fermentation conditions, and your desired taste. In our case, the souring saison was more or less complete after 3 months, but as a group decision, decided to keep it in the barrel for the full year. After souring is complete, keg/bottle and enjoy. For those bottling, extra yeast may be necessary to achieve carbonation after a long secondary fermentation. As for carbonation level, like Flanders beers, I found a high degree of carbonation to achieve the best expression of character for this brew; however, your particular brew may vary. With all this said, try giving a sour saison a try! For reference, see the suggested recipe below. Have you ever barrel-aged a beer for souring or participated in a homebrew club barrel project. Leave your experiences in the comment section below. Cheers and happy brewing! Looks like a beautiful beer, I love sours! This process of combining everyone’s different brew of the same style sounds like so much fun! « The Idiot’s Guide to Homebrewing: My First Book and Some Mega Thanks!